Bali is one of the most requested destinations for the team at International Golf Specialists. Hardly surprising given the great year round climate and incredible activities away from the golf course which keep golfers and non-golfing partners and family occupied to create a fantastic all round holiday. With the ease of access to the holiday island and direct flights from most Australian capitals, you would be hard pressed to find a better and more convenient international location for your next golf adventure. International Golf Specialists can tailor packages to have you leaving your home town in the morning and playing at the Pan Pacific Nirwana, Handara Golf Resort, New Kuta or Bali National Golf Club by that afternoon. Bali evenings are relaxing and the many bars and restaurants along the beaches and throughout the island are the perfect place to unwind and reflect on your game. Whether you are wanting to visit Bali for the first time or want to combine an easy break with some of the best golf in the region, speak to the guys at International Golf Specialists today and let them create the best itinerary for you. Golfers who are yet to spoil themselves and experience everything Bali has to offer, are simply missing out on some amazing courses and best value accommodation anywhere in the world. Easily accessible with direct flights from most Australian capital cities, Bali offers a huge array of getaways for the golf traveller. From the busy streets of Kuta and Semenyak to the relaxed beachside resorts of Nusa Dua and Sanur, golfers visiting Bali can find the perfect blend of amazing golf and the off course adventures they need to make their holiday perfect. Beaches, markets, bars and restaurants not only provide a great place to unwind after your game, but also give any non-golfing partners plenty of activities to keep themselves occupied while you and your golfing mates enjoy the open fairways. International Golf Specialists provide packages and develop itineraries for groups and individuals wanting to travel to Bali – one of our most popular destinations. For the best advice on the ideal time to visit and to create the best golfing holiday possible, speak to the team at IGS today and begin planning the easiest of golf holidays. On my first trip to Bali in 2011, I declined an offer to play golf at Nirwana Bali Club. Whenever I mentioned this to people who knew the course themselves, they would invariably smile, shake their heads and begin to explain to me the golfing paradise I had missed out on. A few months later, work commitments meant I was again in Bali and I decided to stay on for an extra two nights so I could find out for myself why everybody spoke so highly about this Greg Norman designed course. Opened in 1998, Nirwana is a 40 minute drive from Denpasar Airport and is part of the Pan Pacific Resort Hotel complex which offers five star accommodation and all the facilities groups, individuals and families could want to enjoy a completely relaxing holiday away from the hustle and bustle of the main tourist areas of Bali. Conditions for my 9.00am tee time on the September morning I played could not have been better for golf. 25 degrees Celsius, with a gentle sea breeze blowing off the Indian Ocean whose waves wash against the shoreline and crash into the rocks surrounding the Tanah Lot Temple which sits atop a rock formation just 100 metres from the coast. My caddy for the round suggested hitting 3 wood from the tee and advised the best position to play to for an easier approach shot to the green. Her local knowledge and advice throughout the round always proved to be exactly right. From club selection to breaks on greens, the caddies know the course and are extremely helpful, especially for first timers to Nirwana. Every hole at Nirwana offers its own unique scenery, challenge and lasting memory. The signature hole Par 3 - 7th, requires an accurate tee shot to a green perched upon the cliff tops above the Tanah Lot Temple. (The temple itself was built in the 15th century and today is a popular tourist destination to people from all over the world). For such a spectacular hole, I played a very unspectacular tee shot and left myself with a difficult up and down from the bunker to the right of the green which lead to a disappointing bogey. If this is a low point of a round of golf at Nirwana, I will take it. I think it would be impossible not to enjoy a round of golf at Nirwana, no matter how you were playing. The way in which Greg Norman has used the landscape to create 18 magnificent golf holes is truly spectacular. The condition of the course is superb. The tees, lush fairways and impeccable greens are immaculate. The back nine offers diversity to the front and there are more holes featuring water. An inlet on the 11th means the green is almost completely surrounded by ocean water and the tee shot to the 12th green which sits just metres from a vertical drop to rocks and ocean below will leave players who fade the ball aiming well left to avoid impending doom. 16, 17 and 18 were among my favourite holes at Nirwana and are three of the best finishing holes I have played anywhere. 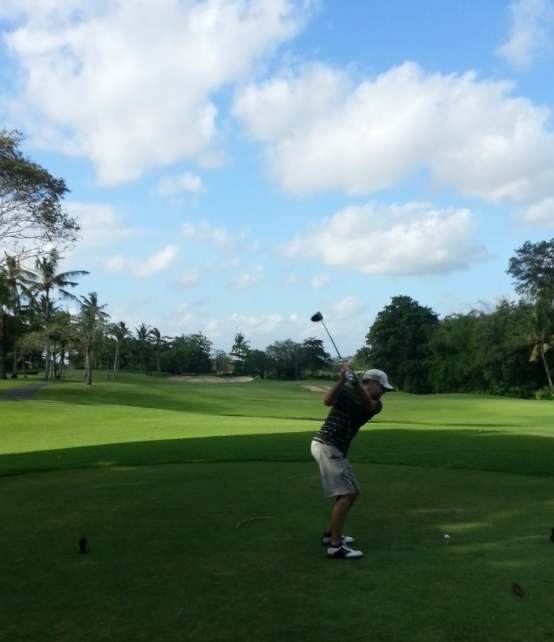 I cannot fault Nirwana Bali Golf Course. The course, facilities and service are all first class and I can&rsquo;t wait to get back to Bali again to play at this amazing golf course. This time though, I am staying for a week. International Golf Specialists (IGS) have packages and exclusive golf tours available to Nirwana Bali Golf Club and the Pan Pacific Resort in Bali. If you are interested in playing one of the best golf courses in the world, contact IGS and let us put a golf trip together for you and your friends.